Remove skin from the duck and trim off all excess fat. Cut duck into fairly large pieces. Season with marinade (A) for several hours. Heat sesame oil and fry ingredients (B) till aromatic. Add marinated duck and young ginger. Stir-fry for a while. Add mushrooms and seasoning (C). Pour in stock/water and bring to a boil. Reduce the heat and simmer for 40-45 minutes or until meat is tender and gravy is thick. In the meantime, deep-fry yam pieces and steam until soft. Arrange yam pieces on a serving plate. 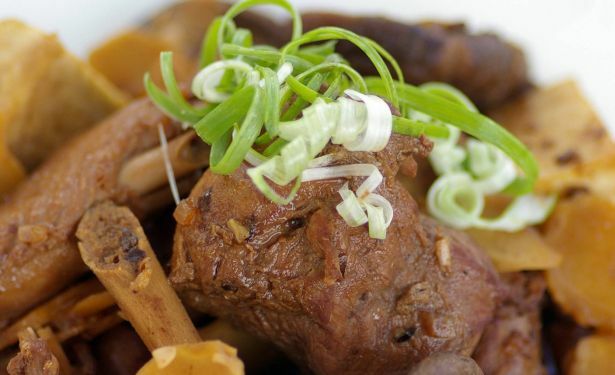 Once duck is ready for serving, dish out onto the yam and serve at once.